The vice president of a New York advertising agency entered Naval Training School in July 1942, and he served aboard the light aircraft carrier USS Langley during many battles in the latter part of the Pacific War. Lieutenant John Monsarrat, a radar specialist on the Langley, held the jobs of Intercept Officer and Fighter Director Officer, responsible for guiding carrier fighter planes to intercept enemy planes identified by radar. Monsarrat skillfully weaves his personal experiences aboard the Langley from January 1944 to May 1945 with the overall history of the Pacific War during the same period. Although the Langley suffered relatively minor damage from only one kamikaze attack, the carrier's crew witnessed numerous kamikaze attacks on nearby ships in the Philippines, Ulithi, and Okinawa. The book also describes how Americans used radar time and again to identify incoming planes, which usually allowed carrier planes to intercept the Japanese far from intended targets. After Monsarrat completed initial training, he worked as Director of Editorial Research in the Bureau of Aeronautics in Washington, D.C. Here and in his later positions he personally met many leaders of the Pacific fleet, so this book contains several interesting comments on their personalities. Monsarrat's experience in public relations for the Navy comes across in the easy-to-understand language and clear chronological organization of this book's 22 chapters. The inside front cover of the book has a two-page map of the Pacific that shows the track of the USS Langley from December 1943 and June 1945 with a legend that briefly describes the events in each location. The back of the book includes a chronology of Monsarrat's service and a date log for the Langley. Many stories in this book deal with radar (word from initials of "Radio Detection and Ranging") used to determine the location of aircraft and other ships. The incidents include the men who worked in the radar plot (compartment), radar's successes in identifying and intercepting Japanese planes, and some technical problems with radar. Although Monsarrat started in public relations in the Navy, he dreamed of being assigned to an aircraft carrier. In April 1943, he started training at the Pacific Fleet Radar Center in Hawaii to qualify as a fighter director officer. In July 1943, he finally achieved his dream when he was assigned to the carrier USS Langley, which was in final stages of construction in Philadelphia prior to its commissioning. The nine officers assigned to the ship's radar had responsibility to supervise the installation of three radar sets, and they decided on the arrangement of the equipment since no standard layout had been determined in those early days of the use of radar. They also had to select 30 men who would work in radar plot, and one chapter gives the methods used to assess whether enlisted men would have the temperament and skills to become competent in radar work. These men needed patience for monotonous hours looking over a radar set, analytical ability to interpret radar readings, and quick decision making in the heat of battle. A Japanese Zero from Formosa that hit the Langley with a bomb on January 21, 1945, killed three and seriously wounded eleven when the plane's bomb blasted a hole ten by fourteen feet in the flight deck. The plane narrowly missed the flight deck and crashed into the sea. The pilot may have intended a suicide attack and just missed the deck, but it is also possible that he tried to escape after releasing his two bombs but ended up crashing after his plane had been hit. The bombing of the Langley provides a good example of discrepancies in the number of kamikaze attacks reported by various sources. The Japanese military determined the number of deaths in special attack forces, such as the kamikaze corps, based on whether planes had orders for a suicide attack and did not return to base. Some of these planes went into the sea far from their intended targets after being shot down or after developing mechanical problems, but the men in these planes were included in the recorded number of special attack corps' deaths. The American side could only estimate the number of kamikaze planes, since many times it could not be determined with certainty whether planes intended suicide attacks or conventional attacks. The Langley's crewmembers witnessed the devastation of many kamikaze attacks on nearby ships. For example, on March 11, 1945, while the Langley was anchored at Ulithi with the crew watching a movie on deck, a Ginga bomber (Frances) hit the carrier Randolph, killing 27 men and putting huge holes in the flight and hangar decks. On January 21, 1945, after the Langley had been hit by a Zero's bomb, another Zero from the same fighter group plunged into the deck of the carrier Ticonderoga with its 550-pound bomb, and then later a Hayabusa (Oscar) fighter hit the burning carrier. The Ticonderoga suffered extensive damage from these two suicide attacks, with 143 killed, 202 wounded, and 36 planes lost. The attacks on the Langley and the Ticonderoga illustrate some problems encountered while using radar. The Langley radar men detected a small group of bogeys (planes not yet positively identified as friendly or enemy planes) 64 miles away and reported this to the task group fighter director on the carrier Essex. The Washington, another ship in the same task group, contradicted the information from the Langley and relayed a message that the targets were friendly, which meant that it was thought that the planes were emitting a top-secret Identification Friend or Foe (IFF) signal to indicate they were friendly. Based on the contradictory reports, the Essex decided to delay sending combat air patrol (CAP) for several minutes, which allowed four kamikaze planes and three escorts from Taiwan to approach the task group without opposition and then make attacks on the Langley and the Ticonderoga. Apparently the Washington gave the incorrect information because of its inability to distinguish between two groups of planes, one friend and one foe, that were approaching the task group from the same general direction. Monsarrat explains that this costly mistake surely reinforced the need for a group fighter director to not hesitate to dispatch planes to intercept suspected bogies when there was a difference of opinion between the radar readings of two ships. For meritorious achievement as Fighter Director Officer of the U.S.S. LANGLEY during operations against enemy Japanese forces in the vicinity of Kyushu and Okinawa from March 18 to May 11, 1945. Exercising skill in the performance of his duties, Lieutenant Monsarrat directed fighter planes in the successful interception of fourteen separate enemy air attacks against our forces, thereby contributing materially to the destruction of a large number of hostile aircraft at a considerable distance from the Task Group to which his ship was assigned. His tireless devotion to duty was in keeping with the highest traditions of the United States Naval Service. Several months prior to the Battle of Okinawa, Monsarrat submitted to Navy officials his idea for using destroyers as radar pickets so that kamikaze planes could be detected and intercepted far away from carriers in the task force. Although he does not claim credit for being the only person to originate the idea, the Navy successfully employed sixteen separate radar picket stations around Okinawa, but the Navy still lost 30 ships sunk, primarily by kamikaze attacks, and 368 ships damaged. These figures include many destroyers at radar picket stations. Even though this book contains many stories about the use of radar and even some descriptions of different types of radar, the book lacks a brief technical explanation on exactly how radar works and the specific equipment involved. The first part of the book contains a chapter on how the Langley officers selected men to work in radar plot, but after that the author does not give any stories about individuals who worked there during battle. The reader could have had a better understanding of their work if the author had included one or two examples of how the men in radar plot worked together to identify planes and how this eventually resulted in the downing of incoming Japanese planes. 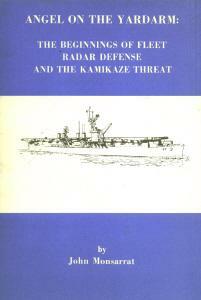 Monsarrat's wartime memoir shows how radar played a critical role in the U.S. Navy's successfully intercepting many kamikaze planes before they got close to their intended targets. The book also gives readers a real sense of what happened in the Pacific War from January 1944 to May 1945 as the carrier Langley operated continuously in the most forward areas and participated in the key battles during this period.